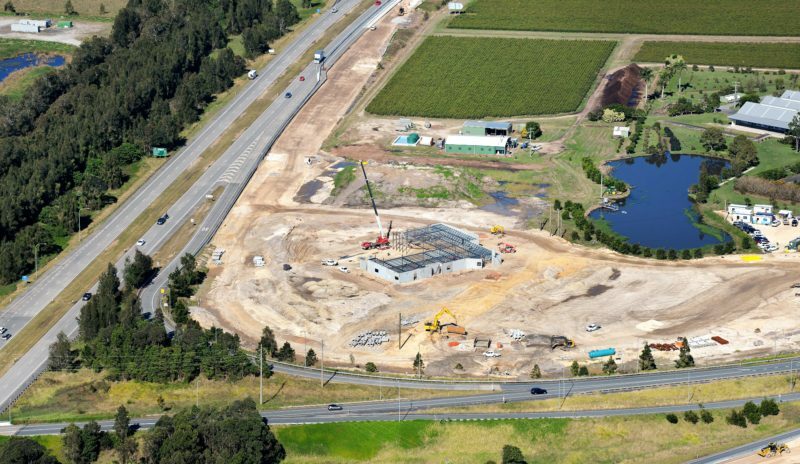 True Water Australia have recently been awarded the Contract to construct a sewage treatment plant for the new Caltex Service Centre at Chinderah in Northern NSW. 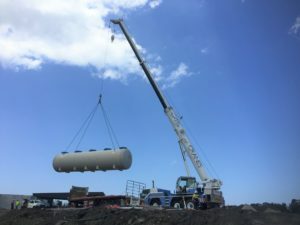 The principal contractor, Hutchinson Builders, engaged True Water to provide a quality solution that would overcome key challenges faced by the $25m development. Design and planning for the project was conducted over 4 years. Several constraints were given high consideration including flooding, site access and available area. 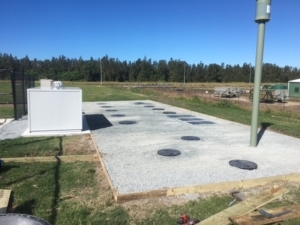 Therefore the sewage treatment plant needed to accommodate significant environmental factors. McDonalds, KFC and Oliver’s Real Food have taken up opportunities to lease the premises long term. Commercial strength wastewater is high in greases and oils. This combined with 24 hour operation provided challenges to the sewage treatment plant and infrastructure operation. Similarly, a high fluctuation in flows during peak and off peak periods such as holidays, required robust hydraulic flow management. Initially an area in excess of 6,000m2 was required for the wastewater management system. True Water worked closely with the developer and consultants to achieve a reduction of more than 60% in size. This was due to our specialist disposal methods. As a result, the developer was able to maximise the footprint of development and achieve a higher yield. Importantly, the sewage treatment plant is located to ensure high amenity and aesthetic value. True Water nominated fKubota K-HC-T commercial sewage treatment as the solution for this site. It will provide long term reliable treatment. The K-HC-T uses biological processing to efficiently treat 40,000L of wastewater per day. The system uses gravity flow to minimise operational cost, all while maximising operational security. The K-HC-T includes buffer storage to safely manage peak flows without compromising treatment quality or producing odour. The Chinderah Caltex Service Centre is now open and is the only service station operating northbound between Broadwater, NSW and Robina, Qld.